Kenya’s government is looking for a strategic investor to buy 19% of the country’s principal electricity supplier, the Kenya Electricity Generating Company (KenGen). Eddy Njoroge, KenGen’s managing director, says the anticipated proceeds from the partial privatization will help fund an ambitious plan to triple the company’s generating capacity to 3,000 MW by 2018. The planned sale will bring down the Kenyan government’s stake in the electricity generator to just 51%. “We’ll be spending approximately $5 billion on building our new generating capacity,” says Njoroge. The money, of which approximately $1 billion has already been secured, will come from a mix of bond issues, loans and the partial privatization of the company, Njoroge explains. The company is also willing to consider build-operate-transfer deals with potential investment partners. Peak power demand in Kenya currently stands at just over 1,000 MW, but it is expected to rise to more than 2,000 MW by 2014, driven by the rapid growth of the country’s economy. Supply is currently heavily skewed toward hydroelectric power, which provides almost two-thirds of Kenya’s electricity. Because of this heavy reliance on hydroelectricity, however, the country suffers considerable fluctuations in its power supply—a situation that hit crisis levels in 2009 when a drought drained many of the country’s key reservoirs. The government is hoping the expansion plan will provide Kenya with a more balanced mix of generation capacity as well as help the country become a global leader in green power. “70% of the new capacity will be green energy—geothermal, solar and wind power,” says Sam Mwale, Kenyan president Mwai Kibaki’s principal administrative secretary. 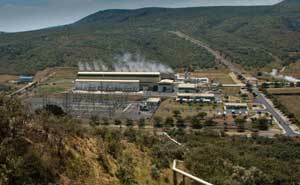 The bulk of the new generating capacity will be provided by geothermal power plants. Kenya is already a regional leader in geothermal power and is home to the largest plant in Africa, KenGen’s Olkaria II geothermal power plant, which generates 70MW of electricity.